Landing pages are a great tool to increase lead generation because they allow you to create individualized messages for different, targeted niches. 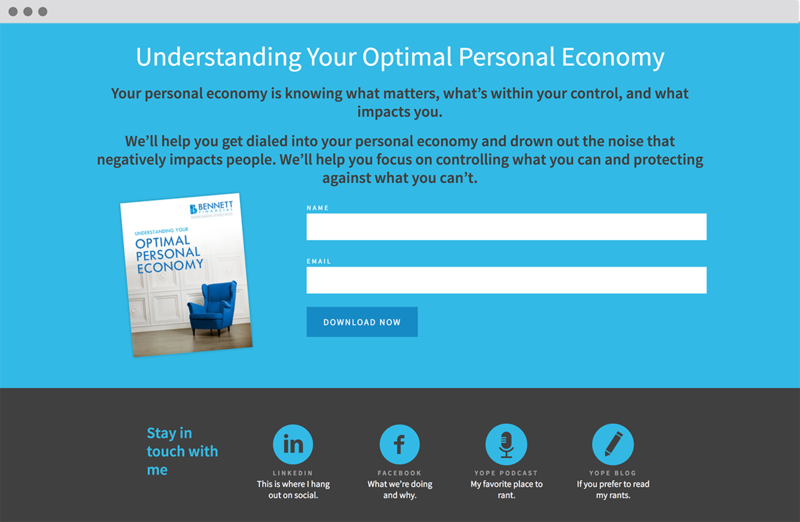 A landing page allows you make your message ultra specific – there is one headline, one unique selling proposition, and one call to action. A focused and targeted message for one very specific niche increases the effectiveness of the landing page’s lead generation. It’s true, landing pages are critical to any successful inbound marketing strategy. As a financial advisor, investing time in well crafted and optimized landing pages is well worth it, as they are a big means to generating business for your firm. Without a landing page, it’s impossible to capture any qualified information about your website visitors, which makes it incredibly hard to market to them, nurture them and ultimately convert them into clients for your firm. And if you’re not taking advantage of Twenty Over Ten‘s unlimited landing pages you’re missing out! That’s right – current Twenty Over Ten clients have the ability to create as many one-off landing pages they want! 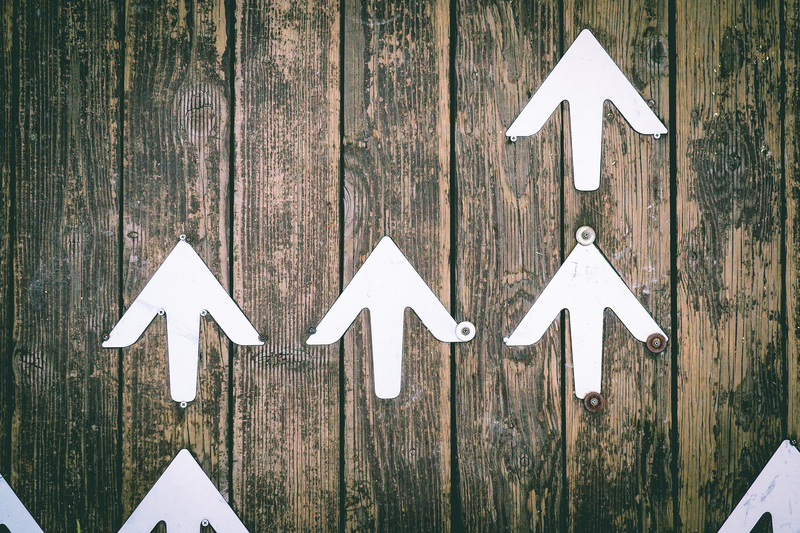 In order to help you make the most of your unlimited landing pages we’re sharing below our top tips for optimizing your landing pages to convert more leads into prospects. Now that you understand lead generation let’s discuss one component of the lead generation process: landing pages. Landing pages are designed to target a set of users by providing an offer, or “Freemium.” Landing pages are designed specifically for the sole purpose to convert website visitors into leads. It’s where your prospects “land” after clicking other marketing links such as from an email campaign and calls-to-action (CTA). To receive the whitepaper viewers must opt-in by providing personal information about themselves such as their name, email address, or phone number. The data collected is then used to feed into your pipeline of clients. Landing pages are not linked to your main website navigation. This allows you to build as many customized messages as you want, while still having a more general message on your main website and homepage. The only way for a user to access the page is through the specific URL, which you might share in a facebook group, or at a speaking event, or in an article you write on a topic relevant to the group you are targeting. You build a landing page for each event at which you speak (for instance, if your main website is HorizonFP.com, your landing page might be HorionFP.com/AARP-New-Jersey. The event page would simply have your logo, bio photo, and information about the event they attended. At the event, you share your landing page with the audience, and encourage them to visit it for a free checklist and guide you’ve created, titled “24 Steps to Take in the 24 Months Before Retirement.” To access the guide, they’ll need to share their name and email address. You can now follow up with these new leads with further information you have targeted directly at them (blog posts, webinars, one-on-one assessments, etc), and start “dripping” on them. You want viewers to take advantage of your offer so you need to make taking the next step as easy as possible for them to complete. If it’s too complicated to find your call to action amongst the clutter of the page, users will simply not do it. You do no want miss the opportunity to engage with a new customer by not clearly defining what you want them to do next. 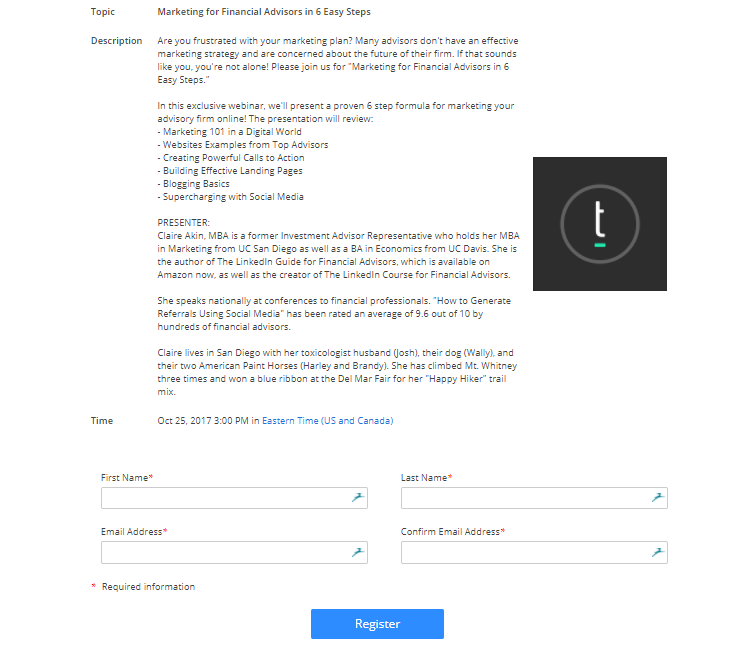 Twenty Over Ten client, Bennett Financial Group, offers a fee ebook to sign-ups. Highlight the aspects of the offer that will make it hard for them to say no. Emphasize how valuable this information is to their lives and bonus- it’s free! Prospective leads need an incentive to hand over their personal contact information and by using bullets to show key points is the best way to do it. 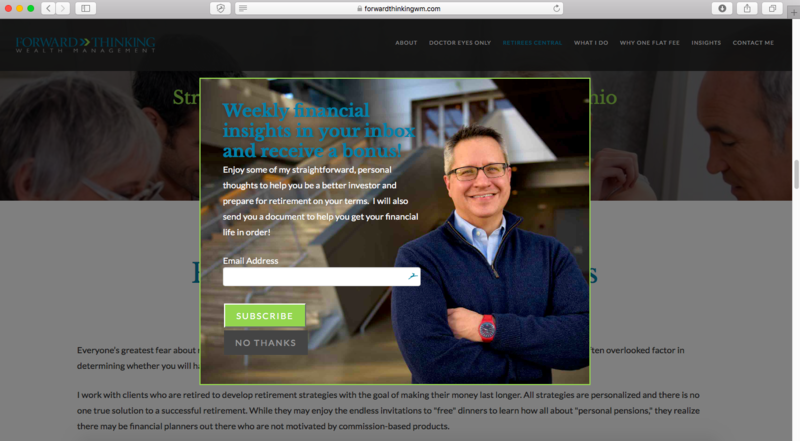 Twenty Over Ten client, Forward Thinking Wealth Management, includes clear benefits for visitors if they sign-up for their newsletter. People are generally protective of their personal information and are not always willing to share it. Think of your own online behavior – what are you willing to provide? A name and email is enough to get a new lead added to your email marketing. Asking for only the most important fields of information will increase the completion rate substantially. Who you target matters. Sharing highly relevant information to a visitor makes it much more likely to convert leads. The best way to take advantage of the opportunity to reach your different customer segments is by creating multiple consumer specific landing pages. However, it is more important to create 10 very well executed pages verses 40 poorly developed pages. The amount does matter, but the quality of content matters so much more. 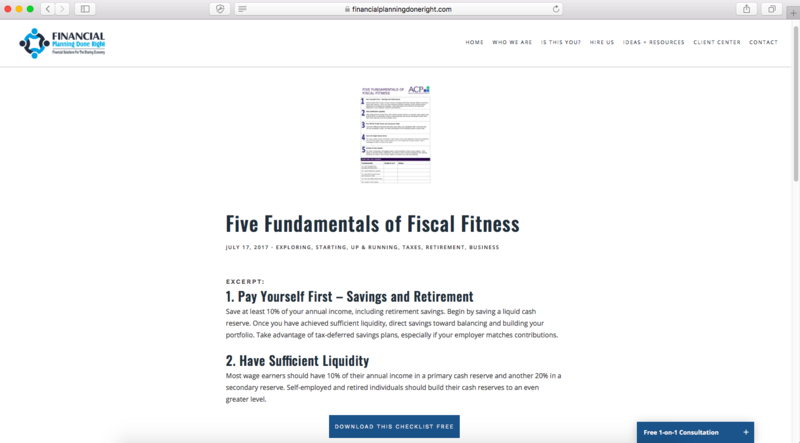 Twenty Over Ten client, Financial Planning Done Right, offers a free “Five Fundamentals of Fiscal Fitness” ebook to sign-ups. At the end of the day, remember this – visitors landed on your landing page for a reason: to get the free offer you promoted. So make it easy for them to do just that. Remove the clutter and distractions and make it enticing and memorable. Ready to start building your first landing page? With Twenty Over Ten you can eaisly create one-off landing pages that effectively promote offerings, connect with niche markets, drive lead generation, and further engage current clients.